During this workshop you will learn how to incorporate the Wunda Chair into the Part C your private and semi-private sessions, how the exercises progress, and most importantly, how to utilize the Power Pilates methodology to help your clients progress. Bonnie began studying Pilates and yoga in 1999 while working part-time as a group fitness instructor in Frederick, Maryland. She was so intrigued by the unique approach of Pilates to the concept of exercise that she decided to pursue her Mat teacher training. 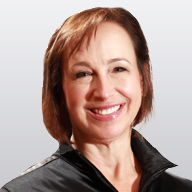 Today, after completing over 600 hours of training and obtaining an advanced teacher training from Power Pilates, she works full-time teaching Pilates (mat and apparatus) to clients in both Maryland and Virginia. She also holds a yoga teacher certification from leading vinyasa teacher Shiva Rae.